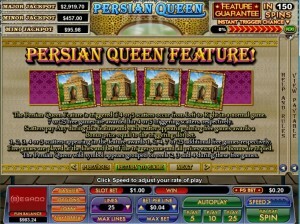 Persian Queen is one of the few slot machines to come with a theme that is inspired by the Persians, one of the bigger ancient civilizations. 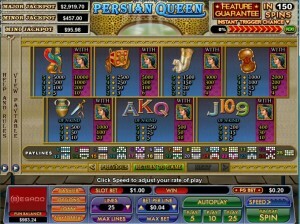 While Rome and Greece have gotten a lot of attention from slot developers, Persia has been ignored until now. 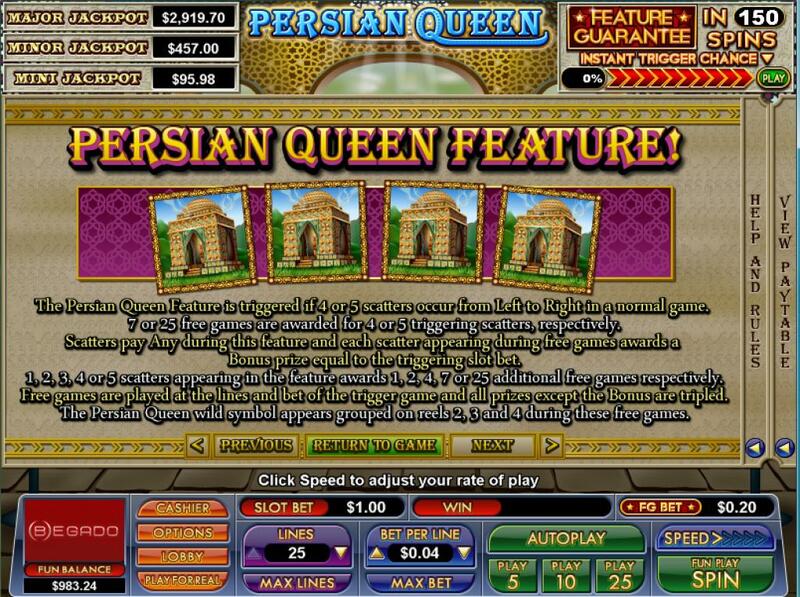 Nuworks has created this slot machine, and if you want to learn something about their empire and about the kind of gods and objects they would’ve used, while also having some fun, Persian Queen should be a good start. Once inside the game, you will discover a title which has 5 reels and on them a maximum of 25 lines. You can win $10,000 by playing it, with features giving you two types of free spins, scatter symbols, multipliers and stacked wilds. 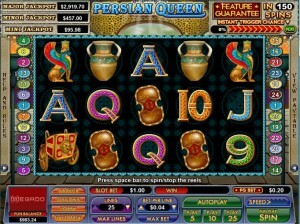 Take a look at the paytable, and you will find on it a wild symbol with a multiplier, a scatter symbol, two types of free spins and their multipliers. The Persian Queen, a beautiful brunette woman wearing a crown, will be visible in the only symbol to come with the role of the wild. The wild symbol appears on three reels, the 2nd, 3rd and 4th ones. The ability to substitute for other symbols doesn’t extend to the Temple scatter, but it will work just fine for all others. If a wild contributes to a newly formed combo, the payout will double. The Persian Temple, a huge square building with gold used everywhere as decoration, will be the one you see in the role of the scatter. As a scatter, you can of course get paid by it whenever you have enough of them, but they can’t be just anywhere. They have to appear from the left to the right, but at least they don’t have to be on the same payline. The prizes will go as high as 100x the bet. 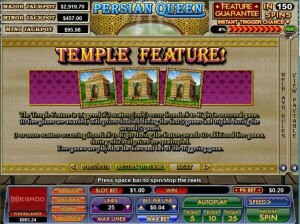 Triggering the slot’s bonus features, with their free spins, is possible when 3 or more Temples are present on the reels. The number of Temples will determine which of the two features you get. In order to get this feature started, you need exactly three scattered Temples to appear, from left to right. 10 free spins will be triggered in this case, which have 2x multipliers during the initial 5 free spins, while the next set of 5 come with 3x multipliers. 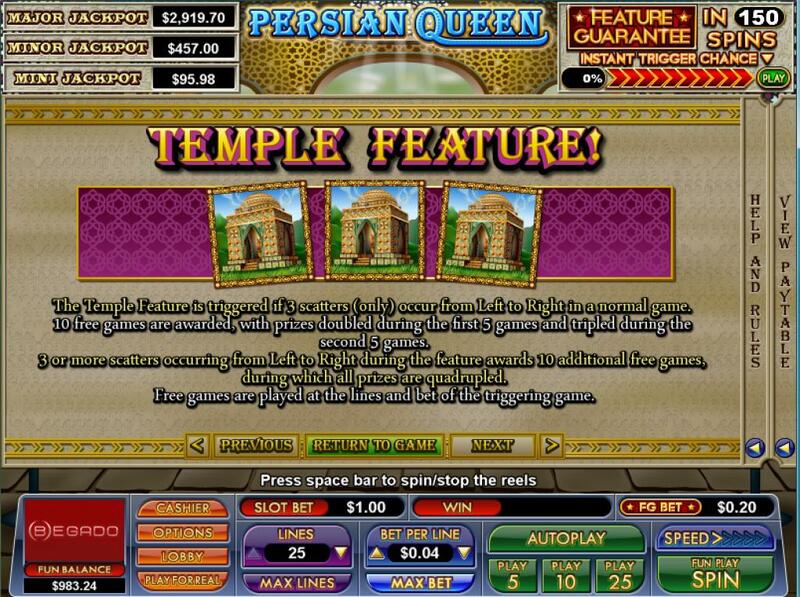 You can retrigger the Temple feature, and it will give you 10 additional spins, but with 4x multipliers this time. 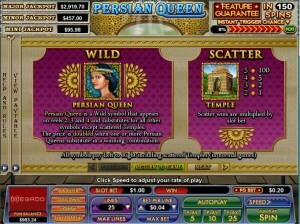 With 4 or 5 scattered Temples, the feature triggered will be Persian Queen, with 7 or 25 free spins, respectively. 3x multipliers apply to all wins obtained along the way, with the exception of the bonuses. The wild symbol will be stacked on the centre three reels, for the duration of the free spins. Bonus prizes are offered for every single scatter that appears during the free spins, and its value is that of the triggering bet. 1, 2, 3, 4 or 5 Temple scatters that appear during the same free spin, will give you 1, 2, 4, 7 or 25 spins, respectively. Those that want to cover all the lines offered by the game will have to use an identical number of coins, 25 in this case. You can select fewer lines if you want to though, while also being able to change the coin denomination as needed, within the range of $0.01 to $1. You can bet up to $25. 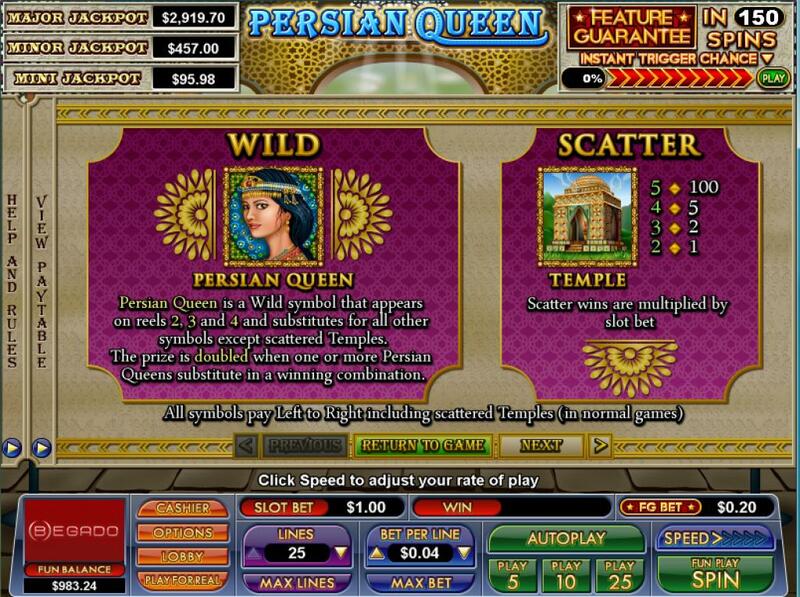 The slot’s top payouts will offer you $10,000 (10,000 coins), but for that you need the Persian Queen wild to get involved, and double the initial 5,000 coins which the game will give you through the Lamassu God symbol. 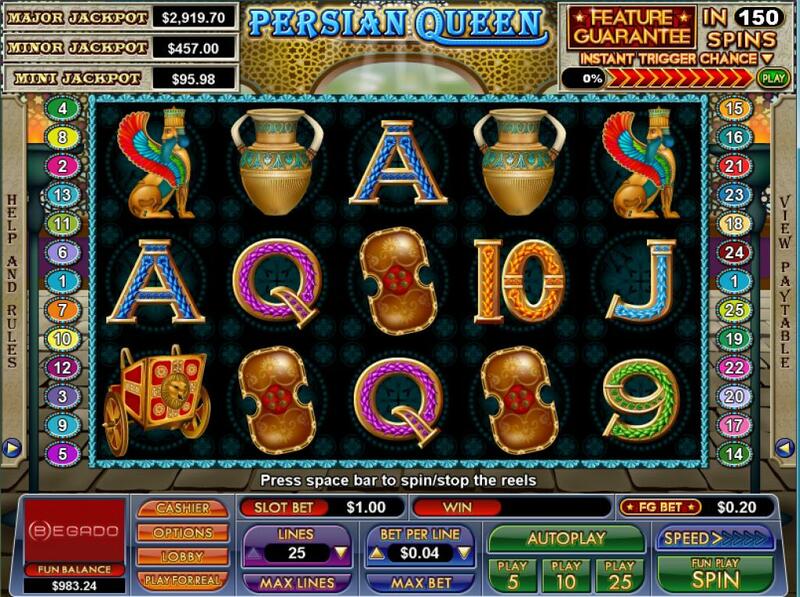 The kind of design that you will see in Persian Queen is similar to the ones used in other slots themed around ancient civilizations, but there are some things in it that you will not get anywhere else. The Persian influence is responsible for that part, symbols including objects in the style in which they created them, along with gods that no other game has offered on its reels. Symbols: Persian Queen (wild), Temple (scatter, 100x the total bet), Lamassu (5,000 coins), Chariot (2,500 coins), Animal Drinking Cup (1,500 coins), Shield (1,000 coins), Amphora (500 coins), Dagger (500 coins), Ace (250 coins), King (250 coins), Queen (250 coins), Jack (200 coins), 10 (200 coins) and 9 (200 coins). It’s not a game that you will find anywhere else, concerning the theme it uses at least, so I suggest you try the version that Nuworks has created for you. The Persian Queen slot machine is offered through the NuWorks platform, so if you want to play it for real or just to practice, look out for casinos that use it.